HAProxy, which stands for High Availability Proxy, is a popular open source software TCP/HTTP Load Balancer and proxying solution which can be run on Linux, Solaris, and FreeBSD. Its most common use is to improve the performance and reliability of a server environment by distributing the workload across multiple servers (e.g. web, application, database). It is used in many high-profile environments, including: GitHub, Imgur, Instagram, and Twitter. In this article, we will go over how to use HAProxy for SSL termination, for traffic encryption, and for load balancing your web servers. 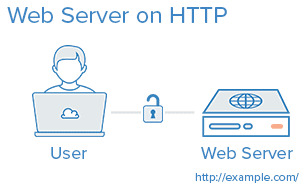 We will also show you how to use HAProxy to redirect HTTP traffic to HTTPS. Native SSL support was implemented in HAProxy 1.5.x, which was released as a stable version in June 2014. Root access to an additional server on which we will install HAProxy. Instructions to set up root access can be found here (steps 3 and 4): Initial Server Setup with Ubuntu 14.04. To implement SSL termination with HAProxy, we must ensure that your SSL certificate and key pair is in the proper format, PEM. In most cases, you can simply combine your SSL certificate (.crt or .cer file provided by a certificate authority) and its respective private key (.key file, generated by you). This creates the combined PEM file, called example.com.pem and copies it to /etc/ssl/private. As always, be sure to secure any copies of your private key file, including the PEM file (which contains the private key). In some cases, you may need to copy your CA root certificate and CA intermediate certificates into your PEM file. If your environment differs from the example, like if you are already using SSL on the web server or you have a separate database server, you should be able to adapt this tutorial to work with your environment. That is, your users will access your website by connecting to your HAProxy server via HTTPS, which will decrypt the SSL session and forward the unencrypted requests to your web servers (i.e. the servers in www-backend) via their private network interfaces on port 80. Your web servers will then send their responses to your HAProxy server, which will encrypt the responses and send them back to the user that made the original request. You can set up your www-backend with as many web servers as you want, as long as they serve identical content. In other words, you can set this up with a single server then scale it out later by adding as many servers as you want. Remember, as your traffic increases, your HAProxy server may become a performance bottleneck if it does not have enough system resources to handle your user traffic. Note: This tutorial does not cover how to ensure that your web/application servers serve the same content because that is often application or web server dependent. Create a new Server with private networking. For this tutorial, we will call it haproxy-www, but you may call it whatever you want. Now that HAProxy 1.5 is installed, let's configure it! All of the HAProxy configuration should be done on your HAProxy Server, haproxy-www. You will see that there are two sections already defined: global and defaults. The forwardfor option sets HAProxy to add X-Forwarded-For headers to each request, and the http-server-close option reduces latency between HAProxy and your users by closing connections but maintaining keep-alives. This will allow you to look at the HAProxy stats page by going to your domain on /stats (e.g. https://example.com/stats). Do not close the config file yet! We will add the proxy configuration next. frontend www-http: specifies a frontend named "www-http"
frontend www-https: specifies a frontend named "www-https"
bind haproxy_www_public_IP:443 ssl crt ...: replace haproxy_www_public_IP with haproxy-www's public IP address, and example.com.pem with your SSL certificate and key pair in combined pem format. This tells HAProxy that this frontend will handle the incoming network traffic on this IP address and port 443 (HTTPS). Now save and exit haproxy.cfg. HAProxy is now ready to be started, but let's enable logging first. HAProxy logging is is now enabled! The log file will be created at /var/log/haproxy.log once HAProxy is started. 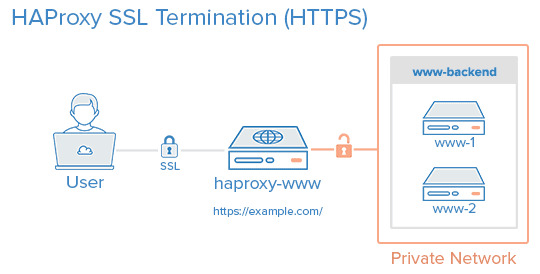 HAProxy is now performing SSL termination and load balancing your web servers! Your load balanced WordPress is now accessible to your user via the public IP address or domain name of your load balancer, haproxy-www! There are a few things that you will want to check, to make sure everything is set up correctly. If you want your servers to use only HTTPS, you will want to make sure that your web servers (e.g. www-1, www-2, etc.) are only listening on their private IP addresses on port 80. Otherwise, users will be able to access your web servers via HTTP (unencrypted) on their public IP addresses. Now you have a load balancer solution that handles your SSL connections and can be used to horizontally scale out your server environment. Feel free to combine what you have learned in this guide with other HAProxy guides to improve your environment even further! [ALERT] 191/173240 (7176) : parsing [/etc/haproxy/haproxy.cfg:21] : 'bind' only supports the 'transparent', 'defer-accept', 'name', 'id', 'mss' and 'interface' options. [ALERT] 191/173240 (7176) : parsing [/etc/haproxy/haproxy.cfg:26] : 'redirect' expects 'code', 'prefix', 'location', 'set-cookie', 'clear-cookie', 'drop-query' or 'append-slash' (was 'scheme'). [WARNING] 191/173240 (7176) : config : 'stats' statement ignored for frontend 'www-http' as it requires HTTP mode. [WARNING] 191/173240 (7176) : config : 'option forwardfor' ignored for frontend 'www-http' as it requires HTTP mode. [WARNING] 191/173240 (7176) : config : 'option http-server-close' ignored for frontend 'www-http' as it requires HTTP mode. [WARNING] 191/173240 (7176) : config : 'stats' statement ignored for frontend 'www-https' as it requires HTTP mode. [WARNING] 191/173240 (7176) : config : 'option forwardfor' ignored for frontend 'www-https' as it requires HTTP mode. [WARNING] 191/173240 (7176) : config : 'option http-server-close' ignored for frontend 'www-https' as it requires HTTP mode. [WARNING] 191/173240 (7176) : config : 'option forwardfor' ignored for backend 'www-backend' as it requires HTTP mode. [WARNING] 191/173240 (7176) : config : 'option http-server-close' ignored for backend 'www-backend' as it requires HTTP mode. [ALERT] 191/173240 (7176) : Fatal errors found in configuration. Please go through the article again and verify your steps, I have updated some prerequisites which might help you to resolve the issue. Also please post contents of your haproxy.cfg file here and let me analyze it. Unfortunately, though, the automatic redirection from HTTP to HTTPS does not work, so I would very much appreciate it if you could take a look into it!